Home / Auction 101 / What is a Buyer’s Premium and why do Auction Houses charge them? A lot of people don’t understand what a buyer’s premium is or why auction houses even charge them. Not every auction house will charge a buyer’s premium, however more and more auction houses are choosing to charge a premium. So what exactly IS a buyer’s premium? Simply put, a buyer’s premium is a additional charge, usually a straight percentage, that a buyer is charged based on the hammer price. This becomes the actual price that the buyer is charged for the item when checking out. For example, if Bob is the winning bidder on a table and chair set that he bid $100 on, and the buyer’s premium is 10% for that particular auction, Bob will actually pay $110 for the item plus any other fees charged by the auction house such as sales tax. Remember, the buyer’s premium is an additional charge, not an additional tax. While auction houses are pretty quiet about the commissions they charge to seller, they do advertise what the buyer’s premiums are going to be. Not every auction house calls it a buyer’s premium. Some auction houses try to get creative and call it things like a “Service Fee”, or a “commission”. Whatever the auction house decides to call it, it still serves the same purpose. Regardless of what they name they give it, U.S. taxing authorities call the buyer’s premium part of an item’s sale price. This is because it’s rolled into the hammer price and the total amount becomes taxable. Buyer’s premiums are not a new idea and have actually been used on and off throughout history. 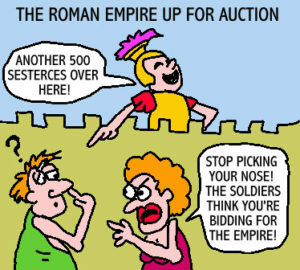 The buyer’s premium was a feature in Roman auctions during the reign of Augustus, when buyers were required to pay a one percent tax on purchases. The modern times the buyer’s premium was introduced by Christie’s and Sotheby’s in London in September 1975 and in the United States is 1977. While major auction houses (like Sotheby’s) will even charge up to 25% on items, most smaller auction houses charge anywhere between 1%-15%. The amount of the buyer’s premium will normally be clearly stated in the auction house terms and conditions. Some Auction Houses like Hueckman Auction only charge a buyer’s premium at their auction house, but do not charge them at the auctions that are on location. The buyer’s premium is considered to be a necessary contribution to the costs of the administrative process for the auction house. Yet many members of the auction community consider it an unreasonable extra charge by the auction house because they do not fully understand why they are charged. Buyers often think this is just another way to get more money out of them. Auction houses sometimes market themselves as “not charging a premium” to gain favor with customers. Regardless, buyer premiums are now becoming a commonplace at auctions and they will continue to grow. In fact, about 80% of all auction now charge some sort of buyer’s premium. But why charge a buyer’s premium anyway? There are several reasons an auction house may choose to charge a buyer’s premium. For most auction houses, especially smaller ones, the buyer’s premium helps to cover the costs of running the auction house and its ongoing auctions. There are many costs that go into an auction house that people don’t consider or even know about. These costs include building rental, heating & air conditioning so customers stay comfortable during the auction, auction software (to keep track of items for both the seller and the buyer), advertising & marketing, staff wages, auction house set-up, time spent taking pictures and creating on-line catalogs for the auction, and general upkeep of electronic equipment. Hopefully this blog gave you a bit more of an understanding about buyer’s premiums and why auction houses choose to implement them. Happy auctioning! This entry was posted in Auction 101, Blog, Buyer's Premium and tagged Auction 101, Buyer's Premium, Christie's, History, Hueckman Auction, Service Fee, Sotheby's. Bookmark the permalink. E Eichler, I don’t think that buyer’s premiums penalize the buyer. Personally, I think that the total price (hammer price plus buyer’s premium) is about the same as if there were no buyer’s premiums. There are differing opinions on this. The buyer’s premium has become customary, especially when it comes to online auctions. At least for us, we have to do what is customary. Buyer’s Premiums should be illegal. It’s just a way for the auction company to double dip on their commission by charging separate fees to both the seller and the purchaser. I disagree that this is a “double dip” situation. Actually, it usually is used to attract sellers by offering them a lower commission rate as compared to the few companies that don’t charge buyer’s premiums. Personally, I think that the total price (hammer price plus buyer’s premium) is about the same as if there were no buyer’s premiums. In other words, the consigner will net the same and the buyer will pay the same, no matter how the fees are charged.